Everything in this picture I made myself! What a wonderful holiday season I am having! Making gifts, baking cookies, EATING. I am just so grateful to have had the most wonderful year thanks to all of you coming to my shows, purchasing my literary designs, and reading this blog. Thank you so much from the bottom of my heart. I hope you have a wonderful holiday season filled with love, laughter, food, and a good book that you can dance to! 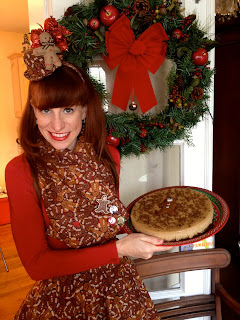 As I am hosting Christmas Eve dinner for my family, I have to run but here's another look at my "I Ran After the Gingerbread Man" holiday video. 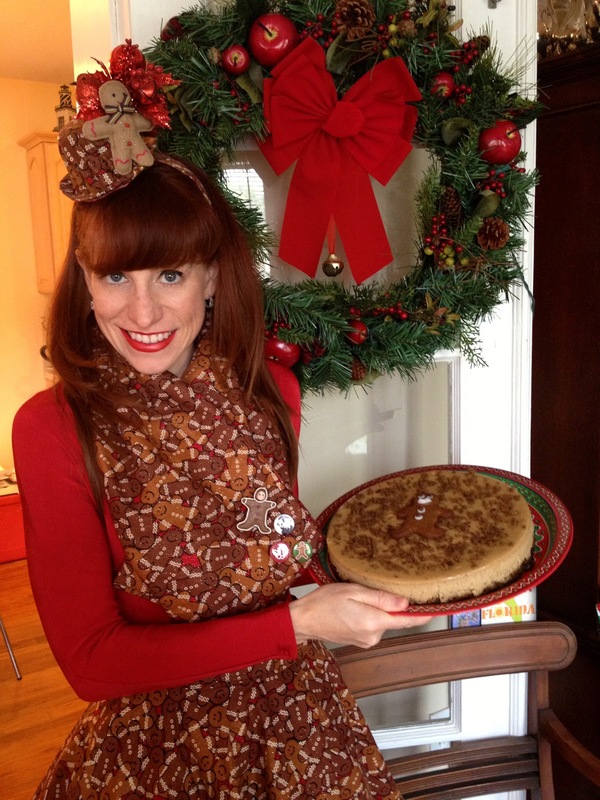 And, yes, I am having four different types of gingerbread tonight: cookies, cheesecake, cake and tea! Order Stand-Up Librarian Designs This Holiday Season! 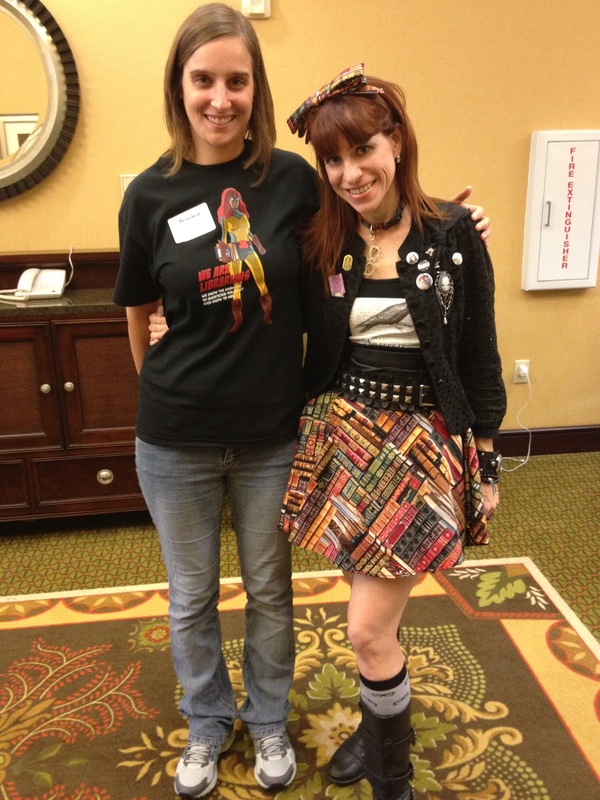 This holiday season, don't forget to order the librarian or book lover in your life one of my literary fashions! 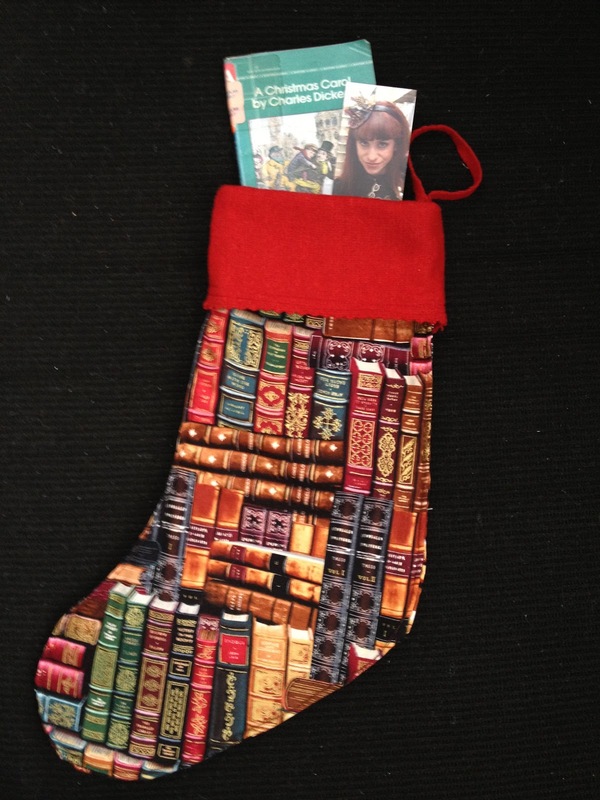 Items include wristlet purses, fanny packs, cosmetic bags, Christmas stockings, scarves and headbands - all in literary prints - because if there is one thing smarter than reading a book, it is wearing it! Please visit StandUpLibrarianDesigns.com for more information (and custom orders), or go directly to my Etsy Shop for items ready to ship. 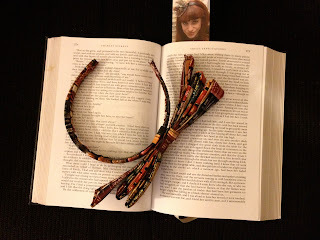 Each item comes with a free bookmark! For a limited time, I am also selling my signature bow headband that I wear on stage. I've had so many compliments on it (not to mention, requests to sell it) that I will try to meet the demand and produce a few of them for my special patrons who want one. Be literary fabulous this holiday season - READ! 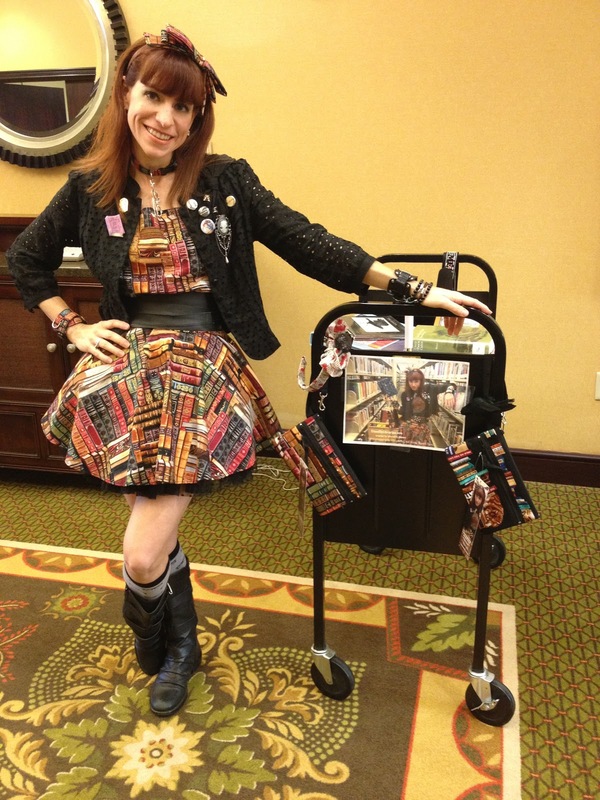 Posing with my book cart before a show. 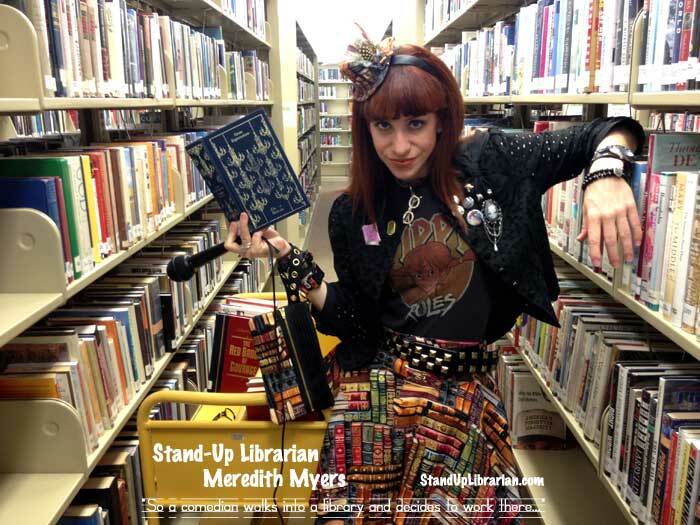 The Stand-Up Librarian Performs at The Strand THURSDAY! 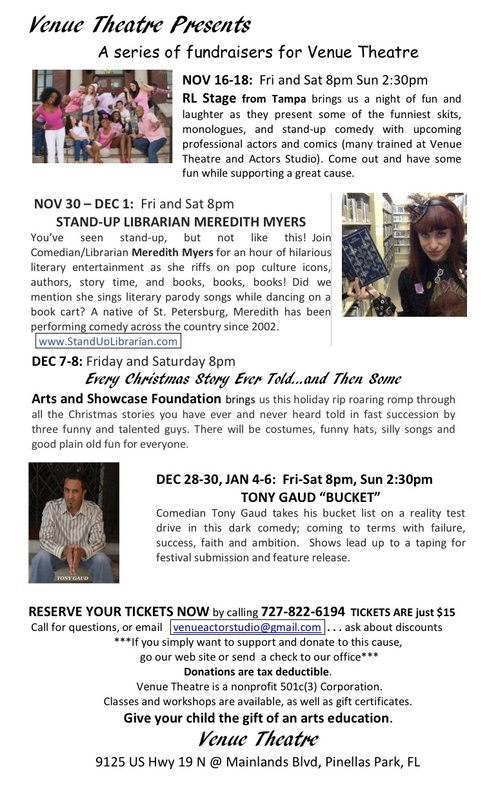 The flier Lisa from The Strand created to promote my show. 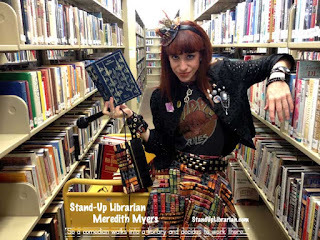 NEW YORK, NY (November 15, 2012) – “So a comedian walks into a library and decides to work there…” Comedian/Librarian Meredith Myers, also known as TheStand-Up Librarian, brings her all-literary comedy show to The Strand Book Store on December 6th. The event begins at 7pm and the purchase of a $10 Strand gift card is required to attend. You’ve seen stand-up, but not like this! 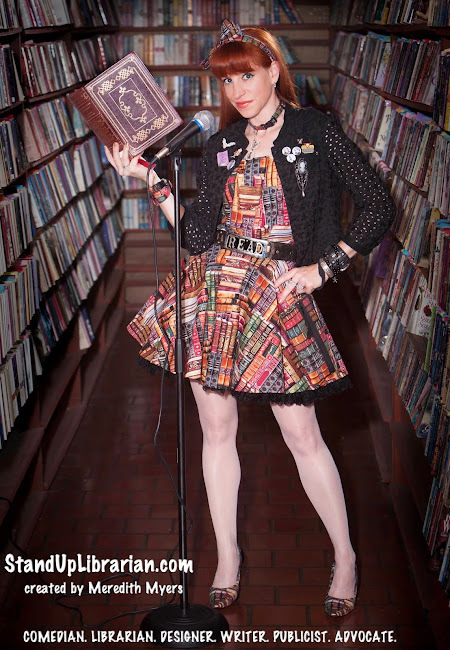 Myers will perform an hour of hilarious literary entertainment for all ages as she riffs on pop culture icons, authors, story time, and books, books, books. 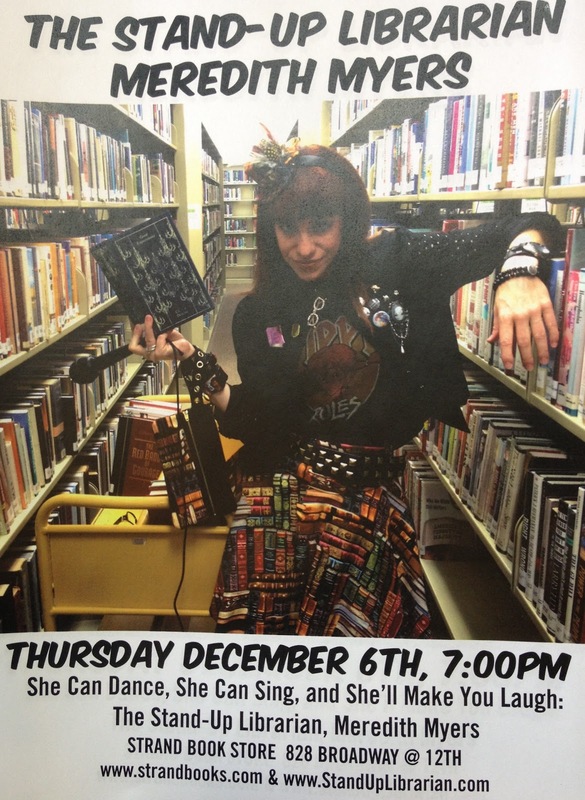 A combination of Pippi Longstocking and Sandra Bernhard with the wardrobe of Carrie Bradshaw, Myers entertains while educates about the importance of literacy and libraries as she addresses Melvil Dewey and the Dewey Decimal System, honors Edgar Allan Poe in a rock n’ roll musical parody, and dances on a book cart in a delicious holiday-inspired musical number all in literary costumes she sews herself! There will most certainly be no shushing at this show! 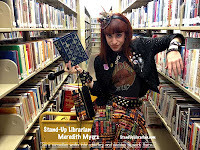 For press inquires and additional information about Stand-Up Librarian Meredith Myers, contact Meredith via email at StandUpLibrarianMM@gmail.com or visit StandUpLibrarian.com. 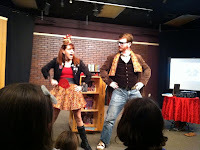 "I Ran After the Gingerbread Man"
I decided to premiere my new holiday literary parody video live on stage at my sold-out shows at Venue Theatre this past weekend where I choreographed a chase sequence with a real ginger man (my friend, librarian Justin Brasher) and concluded with gingerbread man cookies I baked myself. 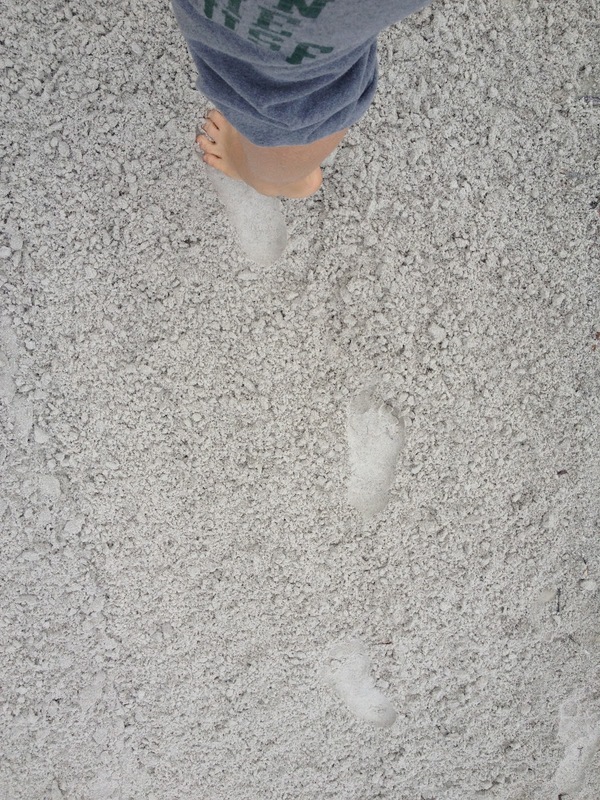 It was so fun (not to mention quite delicious I was told!) 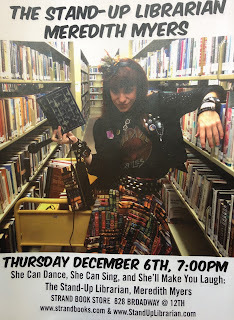 I will also be performing it at The Strand Book Store in NYC on Thursday, but sadly my ginger will be unable to make the trip and me baking cookies might be difficult as well, but I certainly hope anybody in the New York area will still attend the show! Anyway, I hope you enjoy the video. I made the entire gingerbread man outfit myself and actually do own most of the gingerbread man decorations shown. 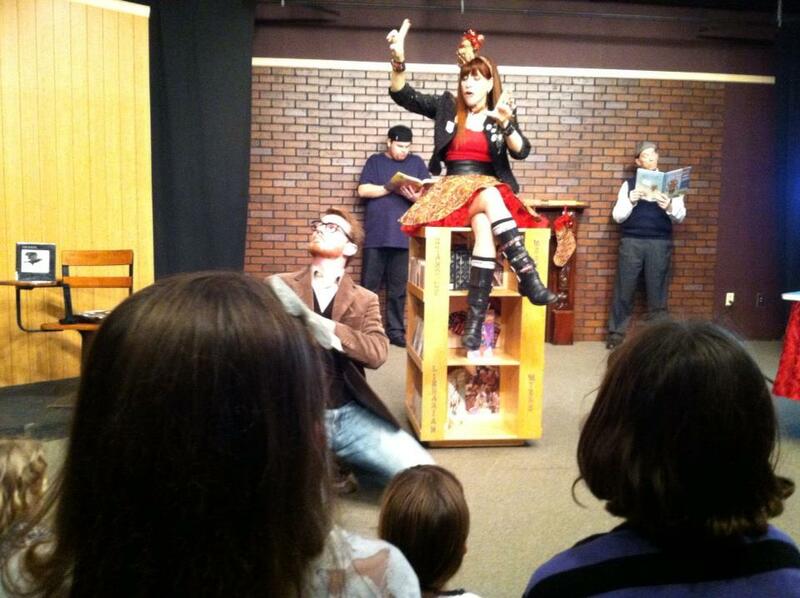 Performing it live on stage at Venue Theatre. Dancing with my gingerbread man. ***For a direct link to the video, click here: "It's the Great Pumpkin, CHRIS Brown"
I can’t believe I did another literary music video so soon after “The Raven is Hard to Handle” but I just love Halloween too much to allow it to go by without giving it some “Pumpkin Luvin.” Everybody close to me knows I obsess around the holidays with anything pumpkin. 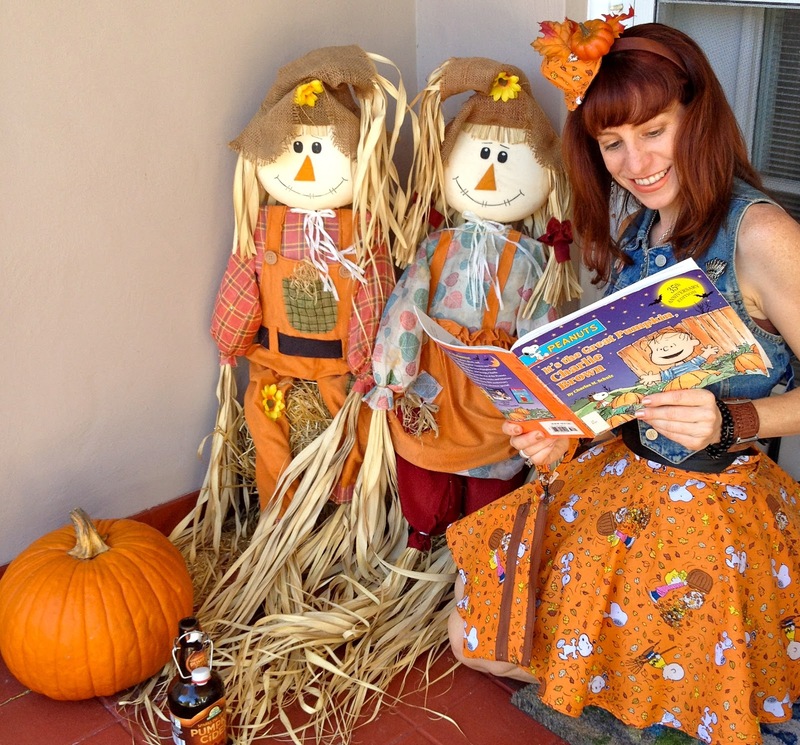 I think I am up to twenty pumpkin food items (my pumpkin tea & pumpkin sparkling non-alcoholic cider being my favorites), so of course being a designer, I also had to sew a pumpkin purse, then a matching hat, and just a week ago decided I needed a skirt too. Wearing my Peanuts hat, wristlet purse, and skirt! So once again the idea for “It’s the Great Pumpkin, CHRIS Brown” came from something I made! But this time it also incorporated a joke I had been performing that mashed up the Peanuts classic It’s a Great Pumpkin, Charlie Brown with a book called Hip Hop Chris Brown. 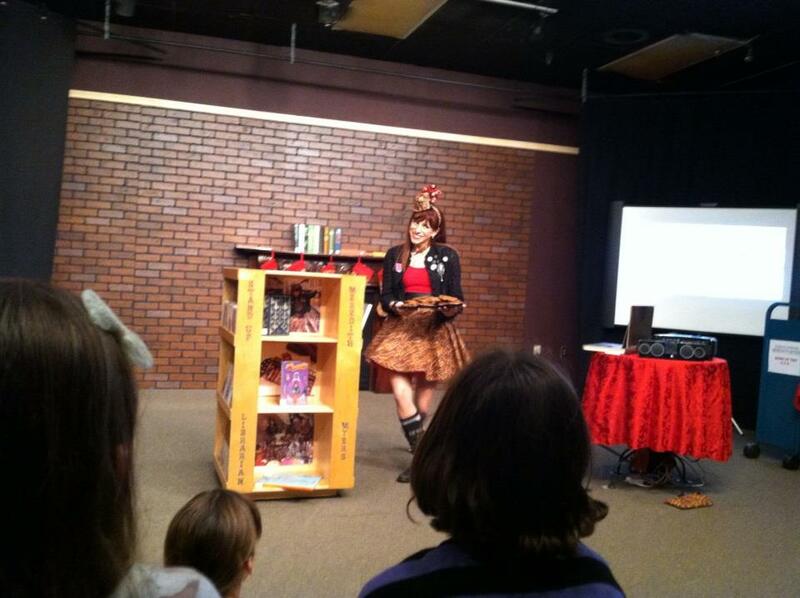 Mashing up books has become my signature at my literary comedy shows. I just love it! But whenever I did the joke, I just knew it could be better with Brown’s music, some of his crazy dance moves, and a whole lot of humor. It's the Great Pumpkin, Charlie Brown meets Hip Hop Chris Brown! Choosing Chris Brown was a risky move due to his ongoing controversy with Rhianna. As a comedian, there were so many jokes I could have incorporated into this thing but as I have chosen to be a comedian that lifts people up, not puts them down, I decided to focus on my love for the Peanuts gang instead. Besides, taking two extremes and mashing them together to promote books and having fun at the library (or at this case the pumpkin patch) is kind of what made me want to do it in the first place. I made Brody this Linus/Snoopy security blanket scarf to wear. And Busta Rhymes is an incredible rapper! The speed to which he raps in that middle section is a true skill. The minute I heard that song, I thought jeez, I bet he reads fast too! And that is exactly what I tried to do. I read the entire book really fast, cut it in two parts, and then put the tracks on top of one another so what you hear is actually the entire story! For Busta Rhymes, I had to wear something batty! 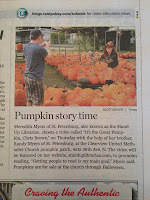 It’s no secret I love to dance and dancing in a pumpkin patch was pretty cool. Boy, did I want to break dance and do flips like Chris Brown but knowing me, I would probably trip on a pumpkin or land on a rake or something, and well, I have Halloween parties to attend and candy to hand out so maybe next year…when I have health insurance. Dancing in a pumpkin patch? A must-do this Halloween! I hope this Halloween when you watch “It’s the Great Pumpkin, Charlie Brown” on TV, you might think of me and little Brody drinking pumpkin juice and dancing to a great story. Then maybe go to your library and sign up for one of the programs there. Just be safe this Halloween. Dressing up as someone else is fun for one night but if you are really lucky, you might find yourself dressing up all the time…and being IN those stories! "Story time with the Stand-Up Librarian" is always a good time! Shooting the video with my brother. 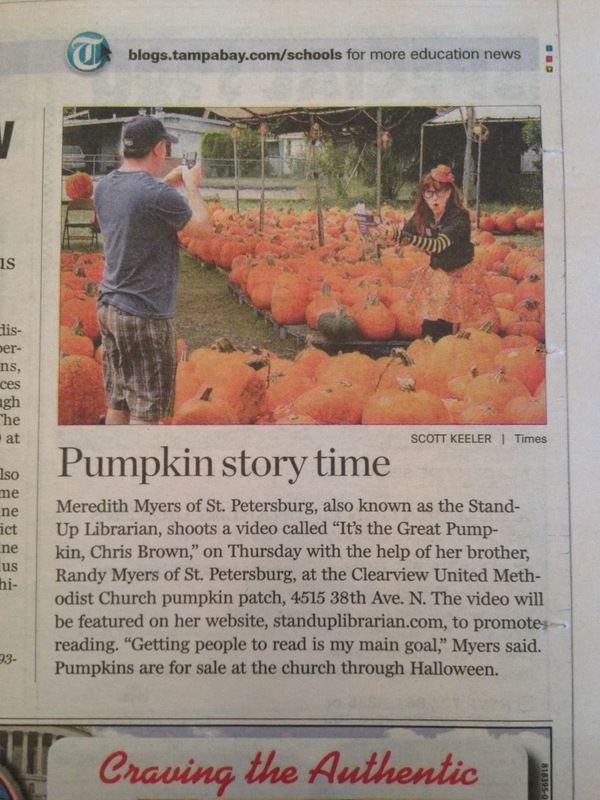 Thank you Tampa Bay Times! Happy Halloween everybody...especially to my friend, Brody! "The Raven is Hard to Handle"
On October 7, 1849, Edgar Allan Poe passed away at age 40 for reasons that to this day are still a mystery. It almost seems a fitting end for the man who is often called the ‘Father of the Detective Story’ and while we may never know the true ending to his life, what we do know is that he had incredible talent for composing words in short stories, essays, book reviews, and poems like The Raven, published in 1845. And I know I am not the only one who has this trouble of grasping language from another time. At least I hope I am not alone. Perhaps there are some kids out there that have my back on this? I also have a hard time memorizing words. It has always been a challenge for me as an actor and comedian to remember my lines – even the words I write myself! So sometimes I need music to help me grasp the material. I need rhythm. Something to sway my hips to is also helpful. It is with these admissions and to honor the great Edgar Allan Poe that I have created a literary parody song that was not only so fun to do but truly helped me learn these three verses of The Raven poem! You are on your own for the rest of it. Thanks to one of my favorite 90’s songs “Hard to Handle” by The Black Crowes, I am proud to share my brand new literary parody song “The Raven is Hard to Handle” where I actually sing! Not necessarily well, but certainly with lots of passion and heart. Oh, don’t you just love Poe’s The Tell-Tale Heart? "Villains!" I shrieked. "Dissemble no more! I admit the deed! Tear up the planks! 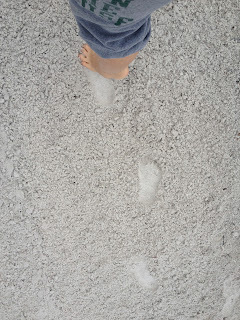 Here, here! It is the beating of his hideous heart!" No, I didn’t memorize that. I have like 20 Poe books here on my desk leftover from the video shoot. As is my mission as the Stand-Up Librarian, I want to promote libraries and show my love to my fellow librarians, so this video is no different. 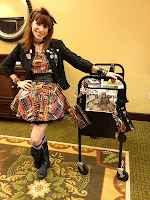 There are several “shout outs” in my costumes and especially on my purse guitar! 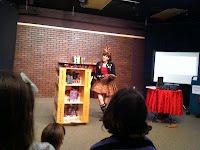 I love literature as much as rock n’ roll, so grab a set of Raven wings and get ready to rock...at the library! The Raven parody idea came to me after making this hat! that I made or re-styled from other pieces I had. With my friend and acting teacher Corinne. I asked her to shush me only 1 minute before we filmed it! 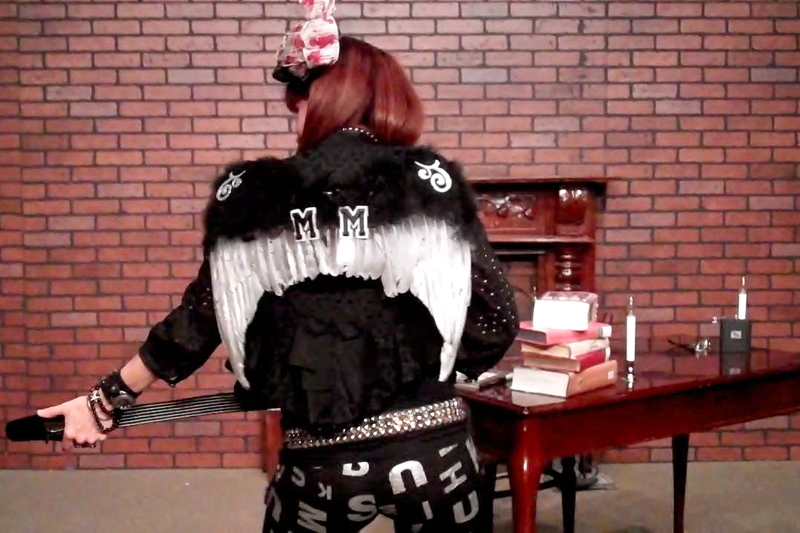 Wearing my silver & black Raven wings. it looked like dripping blood. Too dark even for Poe! ***Please visit: www.StandUpLibrarianDesigns.com if you want me to make you a Raven hat or headband! Or if you are looking for some fashions that are literary fabulous!